Physical Description: 372 pages ; 25 cm H 9.62", W 6.39", D 1.35", 1.24 lbs. A weretiger is neither fully beast nor entirely human. Instead, according to Asian folklore, it wears the skin of a man but remains an animal inside, capable of appearing in either form. In The Night Tiger, a work of incredible beauty from the author of The Ghost Bride (2013), a series of unusual tiger killings in the area of the Batu Gajah district hospital have residents concerned. It is the 1930s and Malaysia, as it is known today, is under British rule. An eccentric old doctor has just died, leaving his 11-year-old Chinese servant, Ren, with a grotesque mission: recover the finger that was severed from the doctor's hand during an expedition, and bury it with him before 49 days have passed, or his soul will never be able to rest. While Ren finds a new job with surgeon William Acton, a friend of the old doctor's, the finger makes a surprise appearance at a nearby dance hall, where it is discovered by Ji Lin, a young woman working to pay off her mother's mahjong debts. That chance discovery is only the beginning of a seemingly supernatural link between Ren, Ji Lin, and three other people with names derived from the five Confucian virtues. 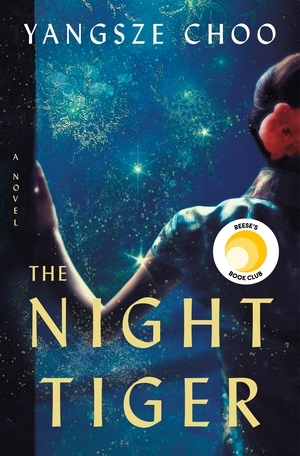 Astoundingly captivating and striking in its portrayal of love, betrayal, and death, The Night Tiger is a transcendent story of courage and connection. Bridget Thoreson. 384p. AMERICAN LIBRARY ASSOCIATION, c2019. A young houseboy and a dressmaker's apprentice get drawn into a mystery in 1930s Malaya. It is May 1931, and 11-year-old Ren's master, Dr. MacFarlane, is dying. Before he takes his last breath, MacFarlane gives Ren a mission: Find the doctor's missing finger, amputated years ago and now in the possession of a friend, and bury it in his grave before the 49 days of the soul have elapsed. In another town, Ji Lin has given up dreams of university study to sew dresses during the day and work a second job in a dance hall; one evening, she is approached by a salesman who presses something into her hand during a dance: a severed finger in a glass specimen tube. By the next day, the salesman is dead--and his won't be the last mysterious death to plague the area. Ji Lin's search for the finger's owner and Ren's search for the digit itself eventually draw the two together and in the process ensnare everyone from Ji Lin's taciturn stepbrother to Ren's new master and his other household servants. Choo (The Ghost Bride, 2013) continues her exploration of Malayan folklore here with questions that point to the borders where the magical and the real overlap: Is someone murdering citizens of the Kinta Valley, or is it a were-tiger, a beast who wears human skin? Can spirits communicate with the living? Should superstitions--lucky numbers, rituals--govern a life? Choo weaves her research in with a feather-light touch, and readers will be so caught up in the natural and supernatural intrigue that the serious themes here about colonialism and power dynamics, about gender and class, are absorbed with equal delicacy. Choo has written a sumptuous garden maze of a novel that immerses readers in a complex, vanished world. 384pg. KIRKUS MEDIA LLC, c2018. Choo (The Ghost Bride) centers her riveting latest on five individuals connected to a series of deaths in Malaysia's Kinta Valley. In 1930s Malaya, 11-year-old house servant Ren accepts the dying request of his master, Dr. MacFarlane, to find his dismembered finger (it was amputated after an accident) and bury it in his grave. The task must be completed within 49 days or else, according to lore, the doctor's spirit is doomed to wander Earth forever. Thus Ren begins to work for William Acton, the British surgeon who amputated MacFarlane's finger years before. As Ren desperately searches Acton's home and the nearby hospital for the finger, the body of a young woman is discovered, her scattered remains presumably the work of a man-eating tiger. Meanwhile, Ji Lin, a dressmaker's apprentice who secretly works at a dance hall, happens upon a preserved finger in the possession of an unsavory customer. Ji enlists the help of her step-brother, Shin, to discover the origin of the finger, but uncanny tragedies and mishaps follow in their wake. Mythical creatures, conversations with the dead, lucky numbers, Confucian virtues, and forbidden love provide the backdrop for Choo's superb murder mystery. Mining the rich setting of colonial Malaysia, Choo wonderfully combines a Holmes-esque plot with Chinese lore. (Feb.). 384p. PUBLISHERS WEEKLY, c2018. In 1930s colonial Malaya, Ji Lin wants to attend university but instead apprentices to a dressmaker and secretly moonlights in a dance hall to help pay off her mother's gambling debts. When a dance partner drops a preserved finger and then turns up dead, complications Ji Lin never could have imagined arise. After Dr. MacFarlane dies, his young houseboy, Ren, is sent to work for a different British doctor, but Ren has his own agenda--find MacFarlane's long-missing finger and bury it in his grave before the end of the traditional 49-day mourning period. The book alternates between Ji Lin's and Ren's perspectives, and their story lines become tangled in unexpected ways long before the characters meet. A string of bodies spells misfortune as a possibly supernatural tiger stalks the characters, and dreams contain messages from the beyond. The final, stunning reveal only succeeds owing to masterly plotting. Steeped in Malayan and Chinese folklore, Choo's opulent writing and world-building deftly work in context and explanation, and the back matter contains further information. VERDICT Weaving family obligations and colonialism with were-tigers and ghosts, this novel is compelling and mesmerizing. That rare literary work that will appeal widely. Jennifer Rothschild, Arlington County Public Libraries, VA. 384p. SCHOOL LIBRARY JOURNAL, c2019. In the lush rural lands of 1930s British colonial Malaysia, Dr. MacFarlane's dying wish weighs heavily on 11-year-old Ren, who is tasked with finding and burying the doctor's amputated finger so his body may be whole again before the 49 days of the wandering soul are over. MacFarlane was convinced his soul would roam the jungles as a mythological tiger if Ren did not complete his mission. Meanwhile, Ji Lin is working a second job in a dance hall to help her mother pay back a gambling debt. In a tussle with an overly forward customer, she finds a specimen bottle with a preserved finger. Uneasy, Ji Lin enlists the help of her stepbrother to return the finger to the original owner, but the specter of death seems to follow them. VERDICT Choo (The Ghost Bride) presents complex characters and multilayered stories in a vivid setting that coalesce into a richly evocative and mesmerizing tale in which myths and folklore intertwine in daily life. For fans of Kate Mosse or Isabel Allende. [See Prepub Alert, 8/27/18.]. Joy Gunn, Paseo Verde Lib., Henderson, NV. 384p. LIBRARY JOURNAL, c2019. In 1930s colonial Malaysia, Ji Lin labors by day as an apprentice seamstress and by night as a dancehall girl working to wipe out her mother's mah-jongg debts. Meanwhile, 11-year-old houseboy Ren has 49 days to find his dead master's long-severed finger and bury it with the body, or the man's soul will wander the earth for all time. When one of Ji Lin's partners leaves behind a stomach-churning artifact, she and Ren work together in a world troubled by inexplicable deaths and rumors of men who become tigers. From the author who debuted with the New York Times best-selling The Ghost Bride. Barbara Hoffert. 384p. LJ Prepub Alert Online Review. LIBRARY JOURNAL, c2018.